LG recently introduced the all-new and award-winning LG Party Speaker, a sound system offering an output of 1,800 watts. Designed to be bold and engineered with Grab & Move handles, the LG Party Speaker (Model: OK99) can easily be moved to enhance any festive environment, regardless of where the party may be. The Blast Horn uses folded air ducts to help create acoustic sound pressure which reinforces the low-frequency range of the speaker resulting in bass enhancement thereby listeners can both hear and feel the sound. Its X-Shiny Woofers, are carbon-layered speakers coated with Shiny Mica, that reflect sparkling lights and raise the premium sound quality with more rigidity and strength. 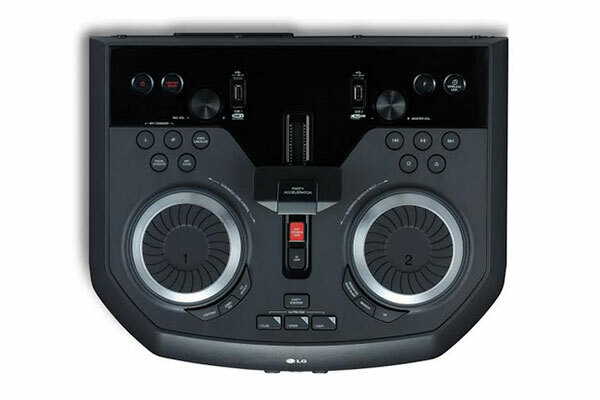 DJs can spin the wheels, mix and scratch naturally with lighting effect on its Pro DJ Wheel. Party Accelerator would allow the DJ to build up the energy and explode in splendid lights when the party hits maximum its peak. By simply sliding the accelerator forward. DJ Loop repeats the beats and allows you to remix like a pro DJ. Party Kick Starter initializes the party with engine sound and flashing lights. The speaker can be linked to another OK99 or any other LG party system wirelessly through the wireless Party Link feature higher output wattage, lighting and party capability.